I think I’m going to create a new category called “Best Laid Plans”. You know, those plans you make where you put a lot of work into them, you think you’ve covered all the bases, you pull out your best organizational skills, and yet it still goes belly up. This is the story of a night out on a chiva bus. Warning: I’m going to curse in this blog post. I don’t normally curse so when I do, it means I’m serious. Sorry, Mom. A chiva bus is a common sight in many Latin countries. It was used for transporting all kinds of goods and people. It’s typically open-air, has a big rack on the top to put more stuff and is pretty high off the ground. They aren’t used so much for cargo anymore, at least not in the city. 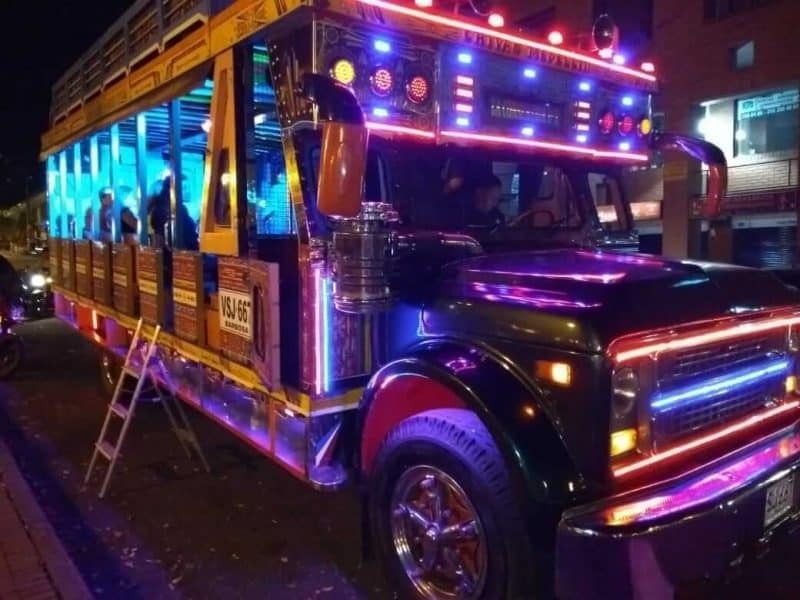 Now they’ve turned into a party bus for locals and tourists alike. The buses are decorated to the hilt, with lights and a massive sound system. If that’s not enough for a party, some of the seats are usually removed so there’s a small dance floor with poles to hang on to while the bus is in motion (and for pole dancing – 2 uses for the price of one). This is a pretty accurate picture of the indoor/outdoor nature of these busses. Here in Medellin we normally see chivas only at night. They are usually packed with scantily-clad pretty people, with hard alcohol being passed around like Gatorade, and music blaring… of course! It’s craziness on wheels as it moves down the street, honking (because they think there’s not enough noise from the music???) and belching large amounts of black smoke. Lots of lights on the nighttime chivas. Note the little ladder, that detail will be relevant later in this blog post. The crazy party might sound fun to you but that isn’t our scene. But still, I was interested. 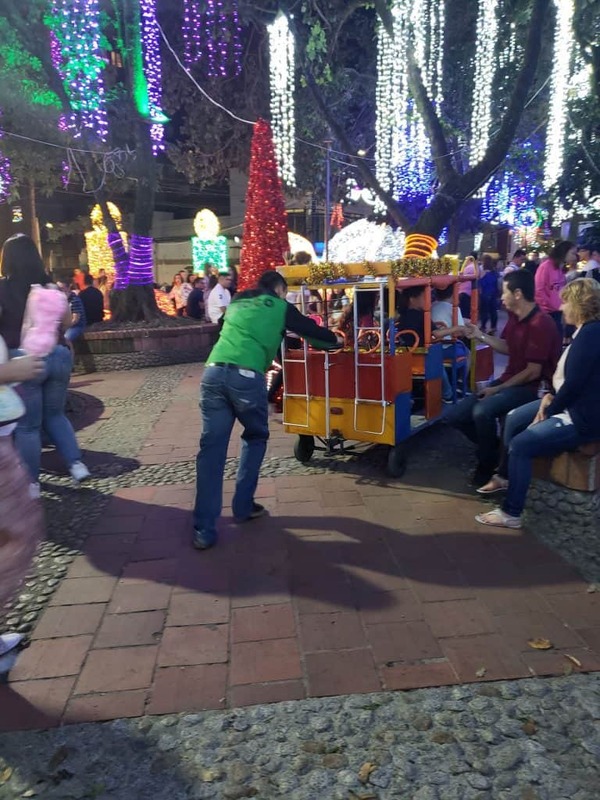 I wanted to ride on a chiva, but in a more normal way, bringing along the kids and listening to music at a lower volume but skipping the drunken fiesta. So I reached out to someone I saw on Facebook who was organizing chivas. I’ll call her Tina. I contacted Tina and said, “We’d like a family-friendly chiva”. I dubbed it “Tranquila Chiva” because tranquila means calm and who doesn’t love a rhyming word-play when organizing, amIright?? I did a quick survey in two Facebook groups and learned that we had as many as 60 family-oriented peeps who would also like a calm chiva experience. 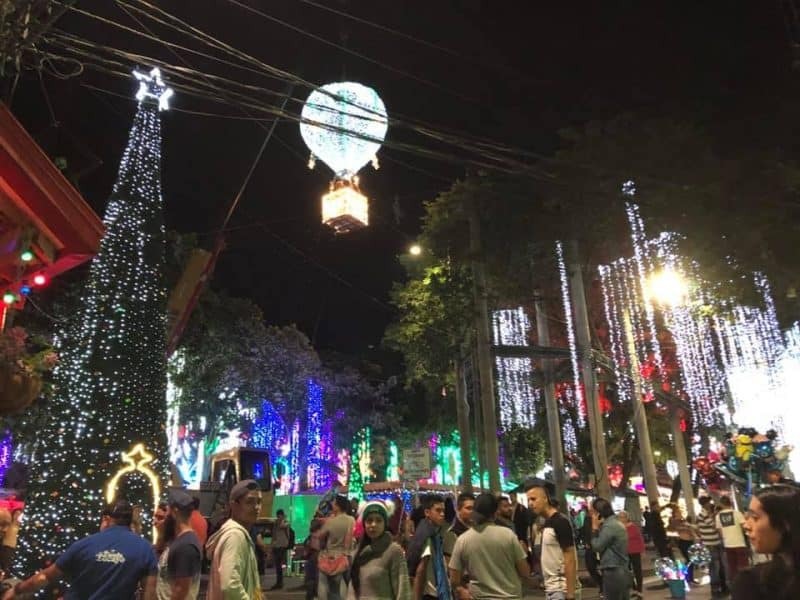 Medellin has a city-wide Christmas light display every year and it’s spread out among all the parks throughout the city. Touring them via chiva sounded like a perfect evening. “Let’s do this!”, I said. 60 other people: “Us too!”. So, Tina and I started working out the details. The normal way of doing things here is if you have to pay someone, you put money directly into their bank account. Like you go to the bank and if you know what you’re doing, you stand in front of an ATM and feed it money. Then hope to GOD you didn’t enter the wrong numbers or whatever. Or you can go into the bank and stand in line… you get the picture. So I began organizing the people who wanted to go and they put their money ($9.16 per person) into Tina’s bank account. By the day the event rolled around, I had recruited 53 people who had paid and were ready to climb up into a Tranquila Chiva. The Tranquila Chiva night arrived and thus began a series of events that left all of us speechless. Well, not exactly speechless, more like “What The Fudge???”. That kind of incredulous, “What could possibly be happening here?” sentiment that only “WTF?” phrase can adequately describe. I will now take you through these WTF moments. Tina told me a specific place that we should meet in order to pick up the bus. 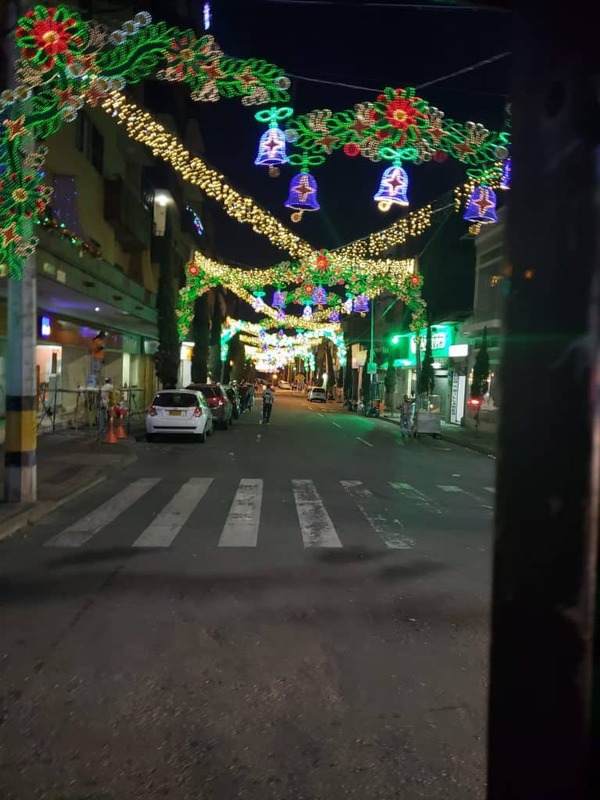 She said that the main park in this area of the city, with the massive light display, was too busy with traffic and the chiva would not be able to park there. That made a lot of sense. So she told us of a place about 5 blocks away where the chiva could park more easily. Perfecto! Let’s do it. While trying to track down the chiva, I was literally standing on the side of the road. All the kids in our group were getting restless and starting to sit on curbs while the parking lot attendant guy was getting irritated that we were blocking his re-arranging of the cars. Finally, the chiva pulled up. It’s kinda unmistakable. However, we noticed a problem right away. The entrance to the chiva is on the RIGHT side towards the back. But the bus is parked on the LEFT side of the road. And by “parked” I mean “stopped in the middle of the lane with all the traffic backing up behind it”. 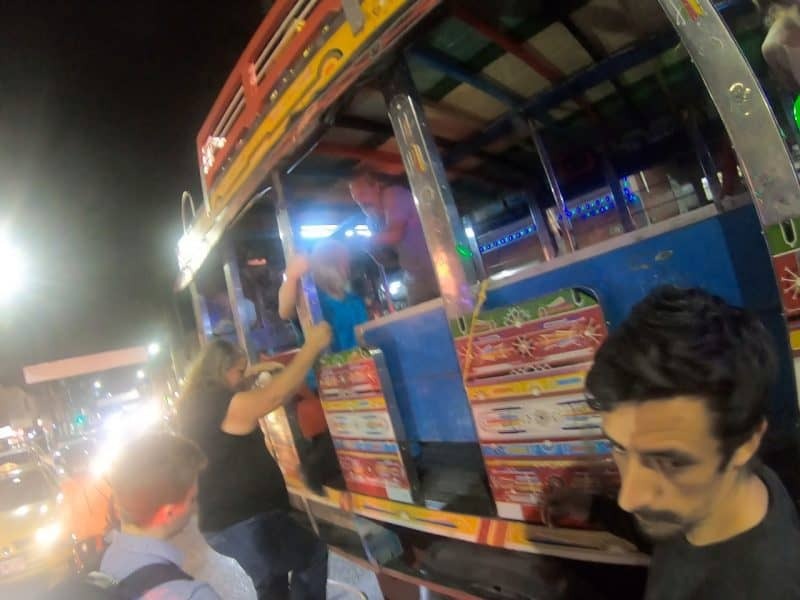 So that means we have to go around the chiva to get on, and we are squished in between the chiva and the cars whizzing by, many of whom are irritated that they just got stuck behind a bus. And remember this is a family-friendly chiva, we have lots of kids in our group! I was really freaked out at how close we all were to the traffic. A taxi driver, who was stopped at the light, gave me the finger wagging saying what we were doing was dangerous. I know, RIGHT? Gracias Mr. Obvious. My friend captured this great shot of boarding the chiva alongside the traffic. WTF subcategory about the boarding was that there was one – ONE – entrance to the bus, and the bus was really high off the ground. The driver brought a very small step stool, but the distance between the top step of the step stool and the floor of the chiva was still too big for actual steps. You kind of had to throw your knee up there and crawl up onto the bus. Family-friendly also meant we had some older people come along and this proved to be very difficult for them. And also slowed down the entire process of boarding, thus keeping us there, squeezed in between the bus and the whizzing traffic, for a lot longer than anyone should have been. Thankfully the smaller kids were able to be tossed up onto the bus by their parents. I still don’t know why there was only one entrance to an open-air bus. I’m having PTSD about the safety aspect of that in the event we needed to exit the bus quickly, but thankfully that did not transpire. So much to unpack in this picture. You can see Dan, not able to stand up straight. You can see a fairly tall woman standing on the highest step of the step stool trying to board. And the guy in blue on the left? He’s about 6’2″ so you can see how tall the bus is. During the planning process I told Tina that “family-friendly” meant we all had to have seats. And I mean ALL of us. She said she’d get a 60-person chiva and that meant that everyone would have a seat. Bueno! But as soon as that chiva pulled up I knew we had a problem. It was small. So small. It had enough seats for probably 20 people, and a large open area in the middle with a few poles for dancing. This is not what we ordered, not at all! And only the smaller of us Americans could stand up straight in the standing area. This is made for much shorter folk. The interior ceiling was at Dan’s shoulder height. Me: Tina! This is not what we agreed upon!!!! Tina: Oh, it’s a little smaller than we talked about. But it’ll be OK, Allison. Me: Tina! Where is everyone going to sit? Tina: It’ll be fun, Allison. Everyone will fit, no problem. 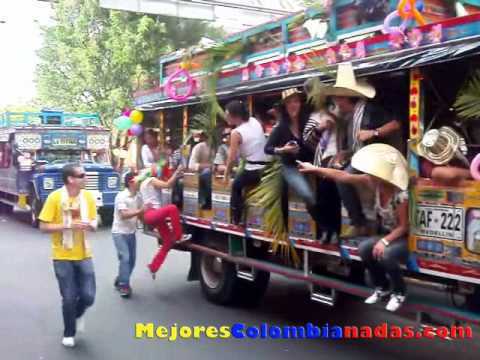 Colombians are famous for their “It’ll fit!” mentality. I thought I had covered that issue with Tina ahead of time but we still seemed to have a vast cultural difference about what “will fit” actually meant. We talked for awhile but Tina failed to see the error of the situation and seemed unable to change it. I announced to the group that this was what we had for the night and we were going to have to make do, but if anyone wanted to leave I would see about getting their money back. At this point Dan bailed. He could not stand up in the chiva and this is not his scene anyway. He told me later that he debated between staying to support me in the ensuing chaos vs leaving and giving me one less person to deal with. He chose correctly. Dan can go-along-to-get-along under most circumstances but after 21 years of marriage I know when he’s uncomfortable, and I don’t like it when he’s uncomfortable. So for him to be on the bus all night long, not enjoying himself, well that would have stressed me out even more. And since our kids are older and don’t need any parental management, it was no problem for him to take off. He bid me farewell and hopped in an Uber and went home. Happy Dan. Thankfully everyone who was on the bus seemed to understand the nature of living in Colombia, and that you just never know what you’re going to get. People squeezed in, put kids on laps, all the teenagers sat down on the floor, some of the people stood and others agreed to swap out standing and sitting. Everyone seemed cheery enough and willing to make do. I was seething but what could I do? Off we went. About 10 minutes after we pulled away from the odd meeting spot, we stopped at a park. Again, we pulled over to the left, while the bus exit was on the right. And now we are on an even busier street, with cars coming onto the fast-moving street precisely at the spot where we parked, being forced to quickly swerve around us. The driver got out his trusty-but-grossly -inadequate step stool and I told everyone to stay on while I talked to Tina. I suggested we move over to the sidewalk to talk and there I tried to understand what was happening. Are we stopping at this park? What are we doing? It was a very small park, with a few lights, a few pieces of playground equipment and that was about it. Knowing the challenge of getting everyone on and off this bus, I suggested we just keep going. I wanted to make sure we had time in the night for the granddaddy park of them all: Parque Norte. Parque Norte, fairly far north in the city, is where the biggest light display is held each year. There are several major streets closed off to traffic, making for a great place to wander, see the lights, get some snacks, see the vendors selling all kinds of fun toys and just enjoy the scene. WTF #5: No Parque Norte??? Say what? What do you mean we can’t go to Parque Norte? He tells me that it’s closed to chiva busses, that the city officials who control traffic won’t let them stop to let passengers on and off. He says we can go there and drive by it but you can’t see a lot of the lights from the road and it’ll take an hour to get there. What is this nonsense I am hearing??? I could not believe it. I tried to tell him that this could not possibly be true, and he said he’d make a call and check. I’m pretty sure he called his girlfriend and had a pretend conversation, and then comes back and said “yep, no Parque Norte tonight. Closed to chivas.”. It is impossible to convey the frustration I was feeling at this point. It was entirely out of my control and going downhill, fast. I could not change anything and yet I desperately wanted to salvage the situation for the people who thought they were paying for a nice night of light displays. From there we traveled awhile to get to the next park in the southern part of this valley, called Sabaneta. 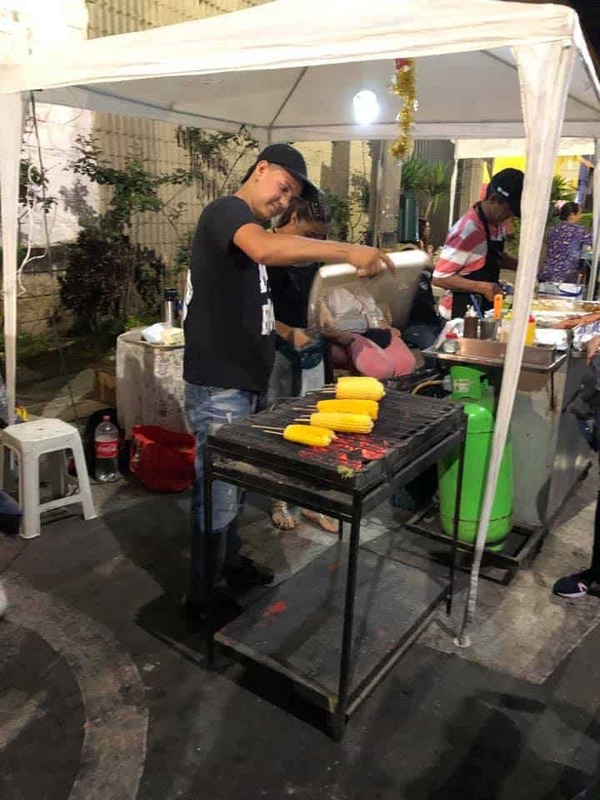 I knew the park in Sabaneta had a great light display and a lot of food and gift vendors, as I had visited a friend in that area the week before. I knew that the chiva passengers would enjoy it and I hoped it would make up for what had (not) happened so far. WTF #6: Where’s The Park? We pull into Sabaneta and we notice an alley way with a lot of chivas parked. Clearly this is where they were all told to arrive. We see other chivas with passengers partying, dancing and being crazy. At the very least I can show our customers that we are not that scene, that we are having a nice time but in a more calm manner. We hop off the bus with the help of Ineffective Step Stool illuminated by my phone’s flashlight. Because clearly the driver has never done this before at night…? I don’t know. I don’t know why he felt like a flashlight wasn’t going to come in handy at some point. I guess it was BYOF. There were a lot of food vendors at the Sabaneta stop. As people are getting off I told them to be back in 45 minutes, as we still had another park to visit. I’m trying to add as much value for their $9.16 as I can! Being mostly Americans, they all noted the time. I was a little disoriented so Tina pointed me in the direction of the park and said “it’s a few blocks that way.” Translation: “A few blocks” = about 6 blocks and a 15 minute walk. If we were in the US, by now I would have fer sure thought I was being punked. Where’s Ashton Kutcher? You got me!! Haha! But no. This is just Colombia. Why did no one tell me it would be a 15 minute walk? I would not have said to be back in 45 minutes if I had know that 2/3 of the time would be taken up just getting there and getting back. I hoped that people discarded their American sense of time and instead adopted a Colombian style. 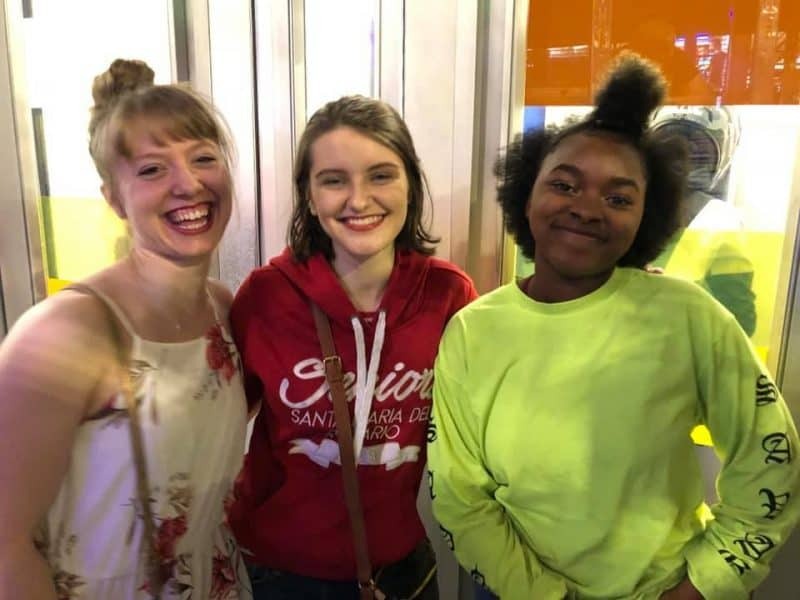 The group of teens wandered off by themselves, the families enjoyed the vendors and the lights and we all enjoyed Santa in the hot air balloon operated by the crane. Zoe and I wandered around and pet all the dogs and got a few things to eat. I was starting to relax, enjoy myself, smile a little and think that maybe it was going to be a nice night. Buckle up, Allison. Your ride is not yet over. There’s a Santa up in that balloon, elevated above the park by a crane. I saw a worker teaching him how to say “Ho Ho Ho” before he went up. Haley and some expat friends had a grand time. Look at all the smiles! At the park the little kids got to ride in a mini-chiva, which was human powered. Fewer exhaust fumes and no ladder. Es bueno. After a short while, Zoe and I made our way back to the chiva. When we were just about there, Haley called me. Haley: Mom, where’s the Chiva? Me: It’s where we left it. They all look alike, look for number 137. Haley: Mom, it’s not here. Tina is calling around looking for it. Zoe and I arrive back where the chiva was parked and indeed, Tina was on the phone trying to find it. Here is my conversation with Tina over the course of the next 90 minutes. Me: Tina, where’s the chiva? Tina: Oh, it just had to drive around the block because it could not park. Me: Oh ok. When will it be here? Tina: In just a few minutes. Tina: The driver left and went to Envigado. He’ll be right back. Tina: He’s on his way back. He’ll be here in 35 minutes. Everyone on our entire bus: WTF???? At that point we lost about half our group. They wandered off to take taxis or Uber or find the metro. I don’t blame them, we really had no idea when our transportation would return. So we all sat on the sidewalk, trying to avoid the dog poop. I noticed some were sharing glasses of rum or sparking champagne. Or perhaps it was cups of their own tears. Not sure. At one point I gave up being polite and refused to speak to Tina. She kept trying to reassure me, explain things to me, talk to me, I don’t know what. I just was done done done with the whole night and stopped speaking. I was not even taking pictures, I was that mad. A lot of times I can take pictures when things are going south, because I know it’ll make a good story. I was too far gone for that. I was sure that this story was NOT going to make the blog. Dan later convinced me that my readers would enjoy the story. Do it for the readers, Allison! 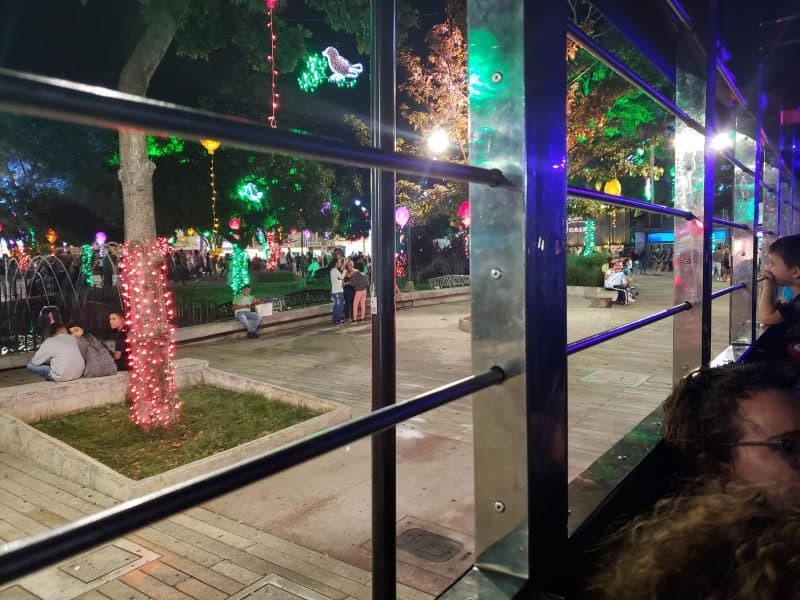 I snapped exactly one picture of a park through the bars of the first chiva. I got tired of sitting on the sidewalk that smelled of urine and noticed an empty chiva sitting there so I climbed on. The driver popped up from her siesta and looked at us but didn’t seem to care. Zoe did not like this unauthorized loitering so she marched up to the driver, explained our plight and asked if we could park our sorry asses in her bus for a few minutes. The driver seemed to take pity on the poor gringa girl who spoke remarkably good Spanish and said it was fine. Tina: Our new chiva is coming, he’s around the corner getting gas right now. You cannot imagine my confusion. So now we’ve given up on the old bus? Where did he go? What did he do? Why did he leave? No one had answers. But supposedly a new, smaller chiva was headed our way. No worries about the smaller bus, we are now a group of about 15 people. Fast forward 10 minutes later and a small chiva shows up. It has about 5 rows of seats, doors at each row to make it easy to get on and off, and it was not nearly as high as our first chiva. We needed no step stool to get on. I’d like to say “the night is looking up” but at this point it’s 11:00 p.m., the time when the tour was supposed to end, and we were still lacking 1 park in our tour (not counting the big one that fell off the schedule long ago) and we had lost about 2/3 of our group. Finally, The Night Ends. Shoot Me Now! This night could not end fast enough for me. I desperately wanted to get the entire thing over with and move on with my life. We drove the 30 minutes back to the starting point of the tour. By this point the open-air nature of the bus was feeling a little less quaint as we all had black lung due to the pollution along the road, the motorcycles idling beside us at stoplights and the exhaust from our own bus. Wow it was intense. We had a few extra passengers on the way home. A few local kids decided to take advantage of the ladder on the back of the bus and jumped on and rode half of the way with us. They jumped off at a stop light. The teens were occupying the back seat and felt like it would be fun to take some selfies with these hangers-on. The hangers-on did not feel the same. The teens took selfies anyway. 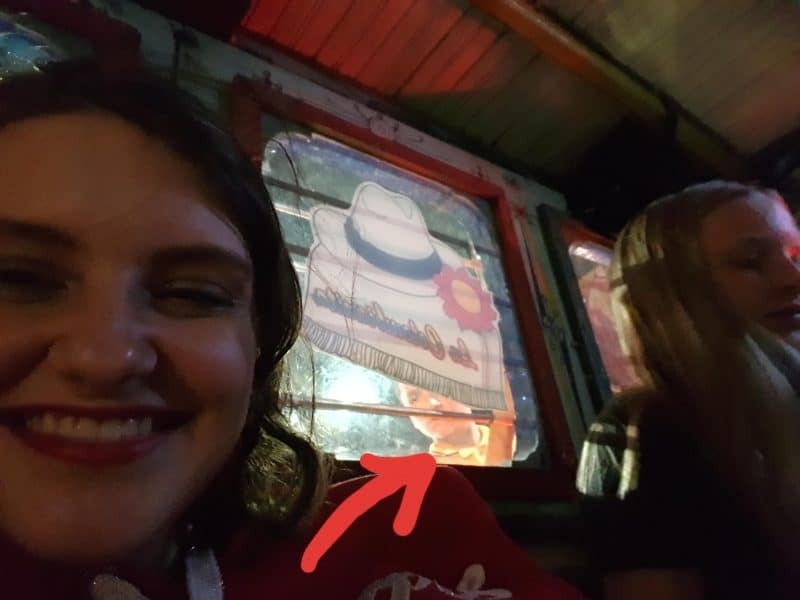 Haley snapped this selfie with the Outdoor Passengers. We got back to our starting point, which was not the parking lot where we were told to meet. I never did understand that mix-up. But that parking lot was where Bryan, our taxi driver, was meeting us to take us home. Of course. So we walked the 5 blocks back to THAT parking lot and now it is about 11:45 p.m. Bryan was a wonderfully familiar face after a long night of craziness. On the way home he gave us his own little light tour, pointing out lights on shopping centers and stores. I told him he could charge $9.16 per person and get a much better Yelp rating than the Chiva From Hell. The streets were pretty as we navigated our way back to the starting point. Of course, all wounds heal with time. I was thankful that no one was hurt, no one was outraged and angry with me, everyone seemed to be mildly amused, with a medium-level-of-disappointment cherry on top. But everyone I have spoken to understands that this is what happens sometimes. In retrospect, I probably should not have accepted shots of rum from the Swiss guy we’d just met three hours before. What else is there to do when stuck on the side of the road at night in Colombia? 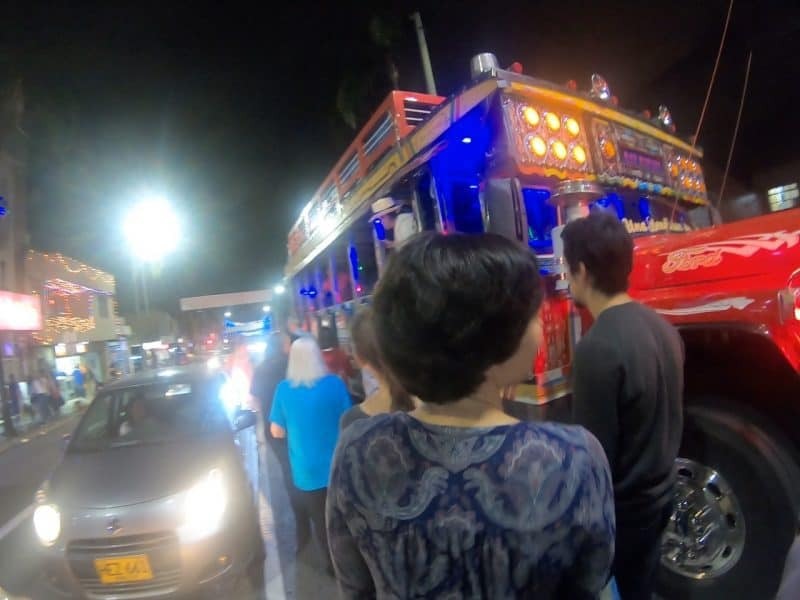 A kind and generous friend included us in a Chiva bus tour of Christmas activities. Despite her meticulous planning, everything went sideways from the word go. The driver was late, arrived in a smaller than promised Chiva bus, and capped it by dropping us off in Sabaneta never to be heard from again. So, we sat on the side of the road, Serbs, Australians, Colombians, Americans, and our new Swiss friends with their seemingly-enchanted-never-empty bottle of rum. It wasn’t as planned. It wasn’t Christmassy. It smelled strongly of a urinal, not chestnuts roasting on an open fire. But, it was lovely. Everyone needs a friend who can see the bright side. I still wish I understood better WHY it all happened. Dan’s Uber driver seemed very surprised at the chiva experience we were trying to have. “Your 12 year old daughter going on a chiva bus? We don’t do that.”. Maybe I just didn’t ask enough questions, didn’t confirm my expectations, didn’t take into account the culture? Maybe I was just trying to do what they don’t do? Who knows. Sometimes you just can’t ask “why?” and move on. I don’t know if Tina was the problem and I don’t want to make her out to be one. She could have been just as much an unwilling passenger along this crazy ride as I was. I simply don’t know. A few days after the chiva experience, after receiving countless messages from her ranging from “I’m sorry” to “It’s not my fault” to “Allison I need more money to cover the cost.”, I sent her a message to say that I didn’t want to discuss it, I was not mad at her, and I wished her a Merry Christmas. This is a truly a fantastic post, I’m glad your husband convinced you to post. It’s a shame you’re leaving Medellin because I would be glad to sign up for the Family Chiva next year, with what you learned you are now a PRO!